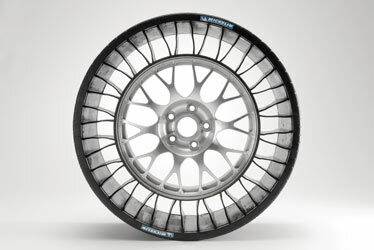 A wheel without an inflated tire may seem old-fashioned  think wooden buggy wheels  but the Tweel from Michelin is anything but retro. A shock-absorbing rubber tread band distributes pressure to dozens of flexible polyurethane spokes. The spokes in turn are supported by an aluminum center. Because the Tweel is airless, it is more rugged than a pneumatic tire and never goes flat. The Tweel has been tested on the IBOT robotic wheelchair and military vehicles. But you won't see it on your Honda anytime soon. Michelin says it is still too noisy for automotive applications.